For the second time, British MPs have failed to gain support for any alternative option to the government’s divorce deal with the EU, plunging the Brexit process into deeper uncertainty just days before the UK’s scheduled departure. Cabinet ministers spent hours on Tuesday behind closed doors in a cabinet meeting, no doubt thrashing out options and attempting to find compromises in a deeply divided party. In a second round of "indicative votes" held on Monday evening, all four motions on different options failed to secure a majority. 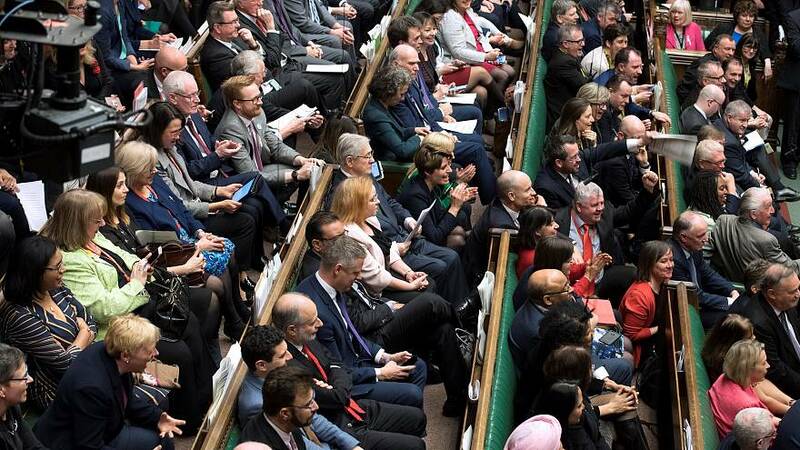 Proposals for a customs union, a Norway-style arrangement keeping the UK in the EU’s single market, a second referendum to confirm a Brexit deal, and a last-ditch procedure to block a no-deal scenario were all defeated in the House of Commons. The votes were not binding but could have increased pressure on the government for a “softer” Brexit. The option to keep Britain in a customs union with the EU came closest to winning majority support, being defeated by only three votes. A proposal to hold a confirmatory public vote on any deal won the most votes, but lost by a margin of 12. Last week saw all eight proposed options fail to secure a majority in the House of Commons, while the prime minister’s withdrawal deal was also defeated for the third time. Prime Minister Theresa May is to hold five hours of cabinet meetings with senior ministers on Tuesday to plan the government’s next moves. The defeats for all alternatives have again raised the possibility that its unpopular deal may be put before MPs for a fourth vote. The latest results brought an exasperated reaction in Europe and from business leaders. Politicians on both sides of the Brexit divide said that a “no-deal” UK exit was now more likely. The EU's chief negotiator Michel Barnier said on Tuesday that no deal "becomes day after day more likely" but could still be avoided. He added that the UK had three choices: accept the negotiated deal, a damaging no-deal Brexit, or a long delay. The deadlock leaves the United Kingdom no nearer to resolving the chaos surrounding its departure from the European Union. Brexit minister Steven Barclay said after the results that the default position was still that Britain would leave the EU on April 12 without a divorce deal. Read more: What's in Theresa May's Brexit deal and why is it so unpopular? Customs Union (C): Proposed by Conservative Remainer Ken Clarke. It calls for the government to negotiate "a permanent and comprehensive UK-wide customs union with the EU". This call for a close EU-UK trading relationship would involve reduced checks on the Irish border, but would prevent the UK from pursuing an independent trade policy. RESULT: 273 in favour and 276 against. Common Market 2.0 (D): Proposed by Conservative Remainer Nick Boles. It calls the government to negotiate for a “Norway-plus” style deal which would see the UK negotiating a customs arrangement, remaining part of the Single Market, to join the European Free Trade Association (EFTA) and the European Economic Area (EEA). RESULT: 271 in favour and 282 against. Nick Boles resigned from the Conservative Party in the aftermath, citing his colleagues' refusal to compromise. On 27 March the proposal was defeated by 283 votes to 188. Confirmatory Public Vote (E): Tabled by Labour backbenchers Peter Kyle and Phil Wilson, it bars a Brexit deal from being implemented and ratified unless it has been approved by the people of the UK in a referendum. RESULT: 280 in favour and 292 against. Last week this option lost by 295 votes to 268, a margin of 27. Parliamentary Supremacy (G): a new motion proposed by anti-Brexit MPs, setting out a series of steps designed to prevent the UK from leaving the EU without a deal. In the last two days with such a scenario looming, it seeks to instruct the government to seek to extend the Brexit process. If that fails, parliament should vote on “no deal”. If that is rejected, the UK should revoke Article 50, and an inquiry should be held to examine a future UK-EU model that could command support on both sides. RESULT: 191 in favour and 292 against. A previous proposal to cancel Brexit by Joanna Cherry of the Scottish National Party (SNP) lost by 293 votes to 184. “This House has continuously rejected leaving without a deal, just as it has rejected not leaving at all. Therefore the only option is to find a way through which allows the UK to leave with a deal. The government continues to believe that the best course to take is to do so as soon as possible” – Steve Barclay, UK Brexit minister. “The House should have a chance to consider again the options that we had before us today, in a debate on Wednesday, so that the House can succeed where the prime minister has failed; in presenting a credible economic relationship with Europe for the future that prevents us crashing out with no deal” – Jeremy Corbyn, opposition Labour leader. “The House of Commons again votes against all options. A hard Brexit becomes nearly inevitable. On Wednesday, the UK has a last chance to break the deadlock or face the abyss” – Guy Verhofstadt, European Parliament Brexit Coordinator. “I am resigning the Conservative whip with immediate effect. The Conservative Party has shown itself to be incapable of compromise” – Nick Boles MP, whose ‘Common Market 2.0’ motion was defeated. “Still no majority. Desperately disappointing. But a way forward is emerging. A mutually beneficial customs union with the EU could build consensus and can’t be ignored. Government must listen and act. Threat of no deal cannot be allowed to undermine economy any longer” – Carolyn Fairbairn, Director General of Confederation of British Industry (CBI). “The Tory backbenches rallied to defeat it… If you’re listening, Mr (Philip) Hammond, my fraternal message to you is: ‘Up Yours!’” – Mark Francois MP. The Eurosceptic Conservative accused Britain’s finance minister of leading a failed coup attempt to stop the UK from leaving the EU. Tuesday April 2: Prime Minister Theresa May holds a cabinet meeting expected to last several hours. Ministers are divided over the UK’s Brexit strategy. Wednesday April 3: a third round of indicative votes is possible. Wednesday April 10: the European Council of EU government leaders meets for an emergency Brexit summit. If no deal has been passed by the UK parliament, Theresa May will be expected to indicate a way forward: ask for another extension, or leave without a deal. Friday April 12: under the extended Article 50 process, the UK is due to leave the EU.